Our collapsible Ripcord Wading Staff makes it easy to wade with confidence. Made in the USA. The design was adapted from avalanche probe technology. Quick and easy to use, but can easily prevent a wading disaster. Four-section collapsible wading staff assembles in seconds. Built with light and strong 7075 aluminum and kernmantle climbing cord that won't absorb moisture, fray, or stretch. 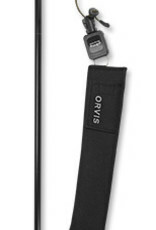 Accessory Kit includes Delrin tip, fly retrieval hook tip, and tip-removal tool. Non-slip EVA grip foam grip. Built-in gear keeper retractor attaches the staff to neoprene sheath that is easily attached to a wader belt. 54"L. Collapsed length 18½". Made in the USA.